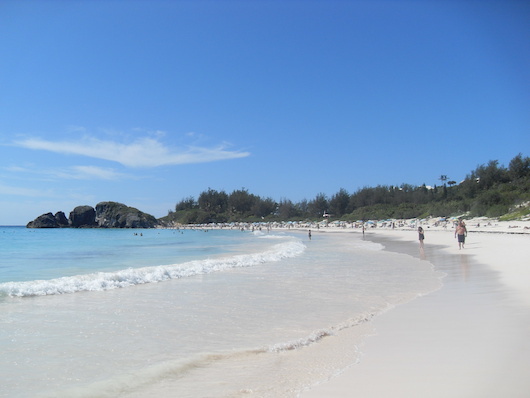 The area around Horseshoe Bay Beach on the South Shore is one of the best spots in Bermuda for running, especially if you’d like to incorporate some of the lovely beaches along Bermuda’s South Shore. Straddling Southampton & Warwick Parish, Horseshoe Bay Beach offers about 1/2 mile of fairly good sand for running. You can continue further east along the beach, climbing over some rocks to get to 1/2 mile long Warwick Long Beach, which is pretty but the sand is tougher for running. 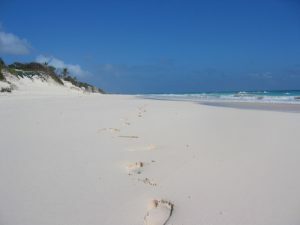 Another option — and more challenging – is to run in the soft sand of the dune paths just above the beach. In South Shore Park, a cliffside trail runs for 1.25 miles from Horseshoe Bay to Warwick Long Bay. And for a longer run, you can run along South Rd. as far as Elbow Beach. There’s a decent shoulder most of the way. From Horseshoe Beach, it’s 1 mile to Warwick Long Bay, 2 miles to Astwood Park, 2.8 miles to Surfside Beach, and 3.5 miles to Elbow Beach. Elbow Beach is also good for running, 0.5 mile long.